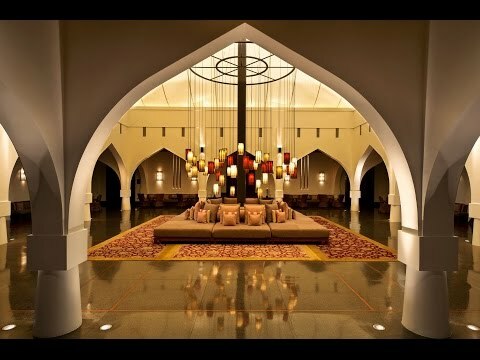 A world of understated elegance and a perfect mix of Omani architecture and a profound Asian Zen-style. Occupying a prime beachfront location, this exclusive 21-acre beach resort is located 20 minutes north of old Muscat, the capital of the Sultanate of Oman, at Al Ghubra. The Chedi Muscat is ideally located for business and leisure travelers alike as the main tourist attractions, the financial center, three golf courses, and Muscat International Airport are only a 15-minute drive away. The Chedi Muscat, Oman's first contemporary hotel, opened its doors in 2003. The resort offers understated elegance and a perfect blend of Omani architecture and Asian zen style. The clean white lines of the low-rise buildings are accentuated by gardens of symmetrical simplicity, with lines of manicured hedges and orderly water ponds, creating a sense of calm. All nonsmoking rooms have breathtaking views across the gardens and ponds toward the Hajar mountains and the Gulf of Oman. On March 21, 2018 the new Muscat International Airport opens. The Royal Oman Police has issued important changes to Immigration procedures and it is strongly recommended that all guests pre-arrange their Visas before travelling to Oman. Please check with the Oman Consulate in your country. With eight restaurants to choose from, enjoy fantastic wines and cuisine from around the world, including Mediterranean, Middle Eastern, Asian and Indian. Dolphin watch in the Gulf of Oman, head underwater for reef and wreck dives, or snorkel among the Gulf’s kaleidoscopic coral and marine life. At what's considered the largest spa in Muscat, expert wellness professionals provide massages, facials, body treatments and an array of beauty services.